When you are drawing realistic texture in pencil, whether it is a graphite pencil or a charcoal pencil, the process is similar. Simply put, you have to think tactile...if you draw something that is rough, think rough. And if you are drawing something that is smooth...think smooth. If the texture is rough, attack the paper in a rough manner and let the tooth of the paper show through. If the texture is smooth, glide over the paper with brushes until you have a seamless, smooth paper surface (for example, a tuxedo or a silk dress). Here is an example where I had to "think rough". 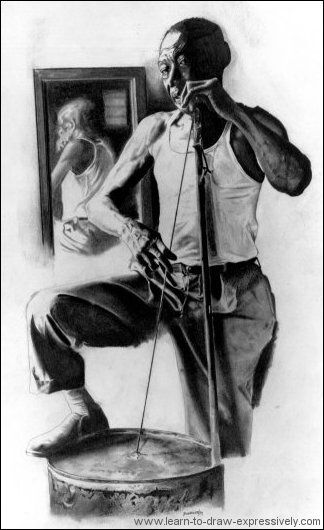 I was drawing a portrait of a bass player who was wearing faded blue jeans. My challenge was how to portray those jeans. I carefully drew the jeans and then took a bold step. I "attacked" the jeans by lightly gouging the paper with an eraser. I knew I was taking a chance on ruining the entire drawing. But, my intuition worked! Aggressively rubbing the paper with the eraser implied washed out areas. The result was a convincing charcoal creation of faded blue jeans. Learning to patiently sit and observe will go a long way in helping you learn to draw expressively. When drawing realistic texture, sit and examine the texture that you are trying to capture. You want to get the tactile sense of what that texture feels like and then translate that feeling through the graphite or the charcoal pencil onto the drawing paper. That requires very close observation to determine what makes each texture unique. 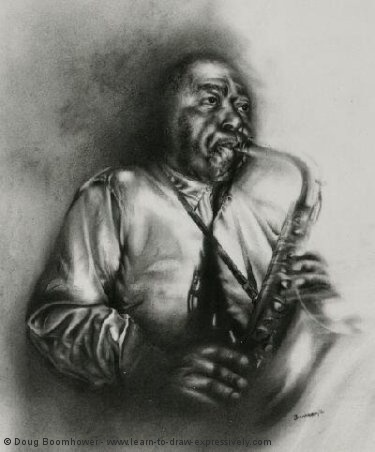 Click on the image of Charlie Parker (below) and learn to draw a dramatically realistic shirt. 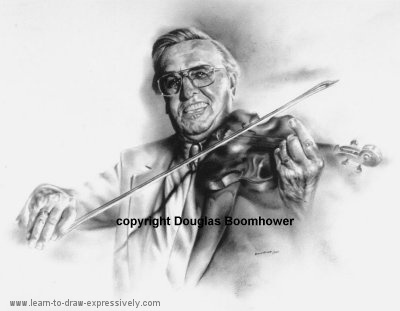 Click on the image below and learn how I made John Kolynchuk's violin look real! Click on the image below . . .
... and I'll explain step by step how I got that barrel to look so real, using nothing more than charcoal, a brush, and a paper stump. 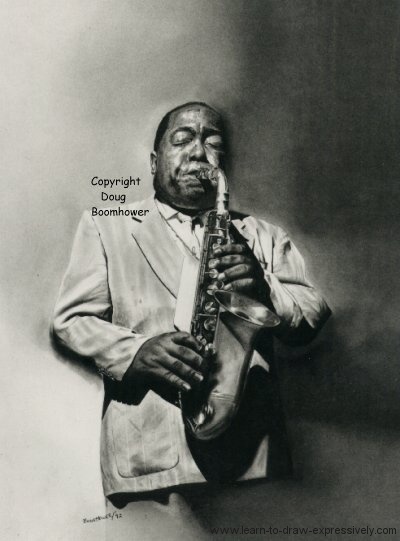 Click on this image of Charlie Parker to see how to make the saxophone look so real. or a leather skull cap. or the metal texture of a horn (saxophone, trumpet).